I am yet to meet a sister who says she doesn’t wish to look her glamorous best for her brother/sisters wedding. More than the bride and groom, it’s the sisters who are more excited about the wedding party. There are so many outfits to plan, different wedding themes to think about, the list just goes endless. If you are looking for glamorous Sister Of Bride Outfits then keep reading. So if you are a 2018 bride to be’s, sister? Do you wish to go ultra glam on the wedding day? 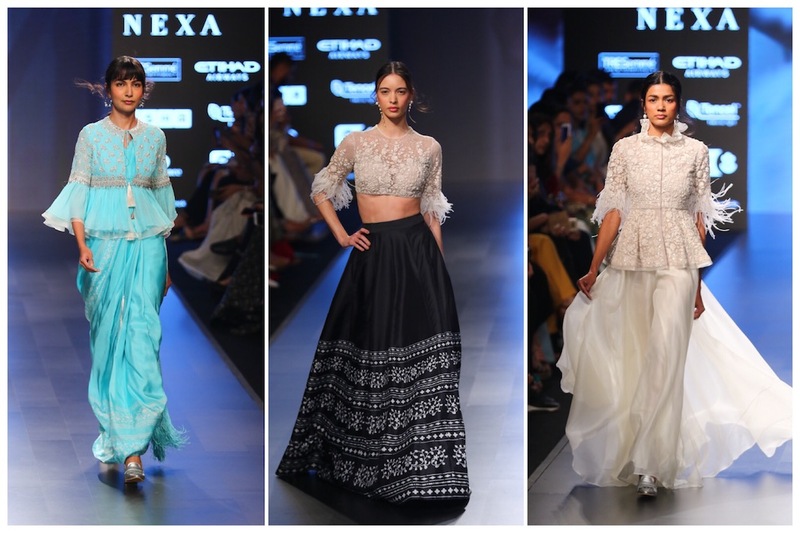 Then, here are some amazing Glamorous Sister Of Bride Outfits by Ridhi Mehra that are perfect for a summer wedding. Just look at this beauty! Dark colours have always caught my fancy and this one here is a stunner to wear. That gorgeous embroidered cape goes so well with the contrasting solid background of the fabric. Which occasion would you wear this outfit to? Is it mint or is it blue? Whatever be the colour, I love it. So fresh, unseen and looks so good in multiple outfit styles. If I had to pick a favourite from these, I probably would choose the peplum saree look. Stunning isn’t it? Which one is your favourite from this colour? Feathers are huge this wedding season. Almost everyone from the bride to the sister of the bride, bridesmaids are donning this feather trend. Be it as a dupatta, or on the sleeve of the blouse, there are multiple ways of styling the feather look. It gives a very cosy winter wedding vibe. But what’s interesting to see is that the trend is carrying forward to the spring summer wedding season as well. Simple, pretty in sheer all three make for the perfect dainty summer dress. This easy breezy white number from Ridhi Mehra is perfect for a white summer wedding.